Dennis Wells is a lucky man in more than one way. 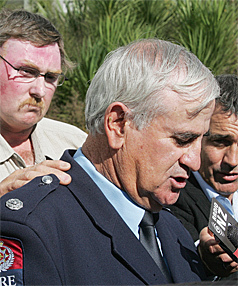 Dennis Wells backed by colleagues including Merv Neil (left), in 2009. The 67-year-old Hamilton fire officer has completed 40 years on the job and retired this week. Two things make Wells lucky. Firstly, he’s always loved his job and secondly, he was one of the fire crew to survive the Icepak Coolstore explosion at Tamahere in April 2008. “I had no intention of becoming a fire officer but I’d bought a home and I needed time to do it up so I needed a job which had shift work and would give me time during the day,” he told reporter Geoff Lewis of Hamilton Press. The April 5, 2008 coolstore explosion killed fire officer Derek Lovell and severely injured Well’s crew mates Merv Neil and David Beanland. All eight officers were injured to some extent. Wells was knocked unconscious, burned around the face, and had his equipment and protective clothing blown off by the force of the explosion. Lovell, standing by one of the fire appliances and furtherest from the blast, was fatally injured by the shock wave. Neil and Beanland suffered severe burns and have taken years to recover. “But they are all back at work now. The Fire Service was fantastic and gave us all the support we needed,” Wells said. The red watch station officer at Pukete, Wells said the job of the fire officer was rapidly changing and fire officers were increasingly called upon to provide initial medical assistance in what the service now calls “purple alerts”. Often Fire Service staff were at emergency and accident scenes a few minutes before the ambulance service and the skills of its staff were crucial in saving lives. A keen car enthusiast Wells said he would find retirement, and waking up to regular hours, unusual as he had become accustomed to shift work.